How Do I Get Enough Protein On A Vegetarian Diet? Protein is definitely not a problem on a vegetarian diet as all foods contain protein in varying degrees. I was just reading an article where it states that whole foods supply us with more than enough protein for our daily requirements and that we really only need 2.5 to 11% of calories from protein which is very little. I remember when I was younger, a doctor stating that he had actually never seen a person in the western world having health problems caused from lack of protein, however he had seen many patients with health issues caused by eating too much protein. Therefore a diet rich in whole grains, fresh fruit and vegetables. nuts, seeds and legumes will ensure that you are getting all the requirements, including protein that your body needs to maintain good health. So let’s take a look at a few high protein whole foods. Nuts – These tasty little treats supply a huge amount of protein to your diet. Any type of nut in any form including nut butters will increase your protein intake. A small handful of nuts between meals will boost your energy levels and fill you up until your next meal. Watch the salted version though, we don’t want to eat too much salt! Seeds – So many varieties of seeds are available these days, I remember when it was only pumpkin, sunflower, flax and sunflower seeds, but these days we also have quinoa, chia, hemp, pomegranate and the list goes on with new ones being added on a regular basis. As they say, variety is the spice of life. 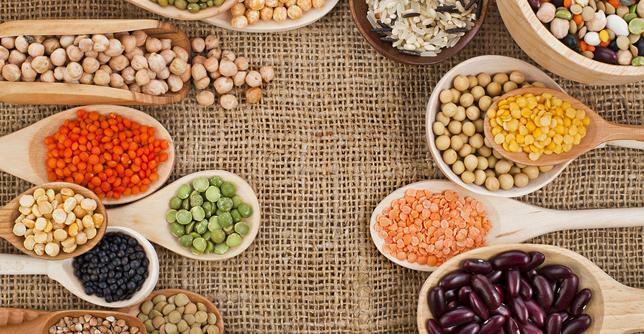 Beans and Legumes – are super high in protein. Once again there is a variety of them too numerous to list here, but few of the more commonly known are lentils, dal, kidney beans, mung beans and of course, the humble soy bean in which all soy products are derived including tofu, soy milk and soy cheese to name but a few. Dairy – If you are vegan you can skip this section, but dairy is a heavyweight in the protein stakes. So there you have it. We don’t really need to worry too much about getting enough protein in a vegetarian diet. All we need to do to ensure we are getting enough nutrients including protein is to eat a healthy, balanced and varied diet of whole foods. Now we know where to get food to satisfy the needs of our body, but where do we get that food to satisfy the needs of the soul. This is a question that often goes unanswered. We can have a super healthy body, but still be empty inside and that is because we need inner-nourishment, we need food for the soul. I can find that food for the soul in Mantra Meditation. These beautiful Mantras are descending from the spiritual realm and will satisfy the soul.